As of the new year, there are a number of new traffic laws in Illinois. While some of these are finer points of law & procedure, here is a brief rundown of the four major updates that every driver should be aware of. 1. 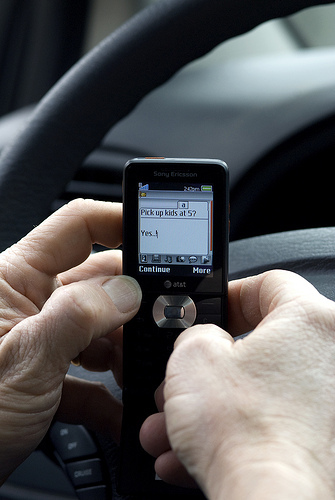 By far the biggest change is the statewide cell phone ban, which bans any use of a cell phone and other electronic devices while driving, unless it is in “hands-free” mode, is a GPS “physically or electronically integrated” into a vehicle, used for emergencies, or in a few additional exceptions. 625 ILCS 5/12-610.2. Likewise, driving while anyone in the front seat uses a video player is prohibited. 625 ILCS 5/12-604.1. Both bans come with additional criminal penalties if any accident occurs while using these electronic devices. Quick advice: don’t drive while using a handheld device. 2. The speed limit on Interstates and 4-lane highways is now 70 miles per hour in all counties, except Cook and the “collar” counties of Chicagoland, who can set their own limits. Quick advice: pay attention to the posted limits. 3. School districts are now able to equip cameras to catch drivers who pass a school bus while the stop arm is out and the red lights are flashing. These operate similar to red light cameras, in that the photo is taken and the notice sent by mail. 625 ILCS 5/11-208. Quick advice: just don’t do it. 4. If you do get pulled over and asked for insurance, you may now use an iPad, smartphone, etc. to demonstrate insurance coverage. Keep in mind that handing the officer your device for this “does not constitute consent” to search through the device. 625 ILCS 5/7-602. However, this may not protect you against suspicious evidence that might pop up in a text or email while you are pulled over, even if it is just a joke from your friends. Quick advice: be careful about what you hand over in a traffic stop. There are numerous more updates to traffic laws and criminal laws in Illinois for 2014. For more details or for issues not covered here, feel free to contact my office at 815-322-9818 or colin@leichtlawoffice.com. DISCLAIMER: Please do not prepare your own documents / filings after reading this blog, without consulting an attorney first about your specific situation. I make no representations or guarantees here as to the applicability of any claim in your specific situation. This blog is ADVERTISING MATERIAL only, and should not be relied upon as legal advice specific to your case, especially if you are not an Illinois resident. No attorney-client agreement will exist between myself and any readers of this blog unless it is signed in writing. This entry was posted in Other Areas and tagged cell phone ban illinois, new speed limit, traffic law illinois 2014. Bookmark the permalink.